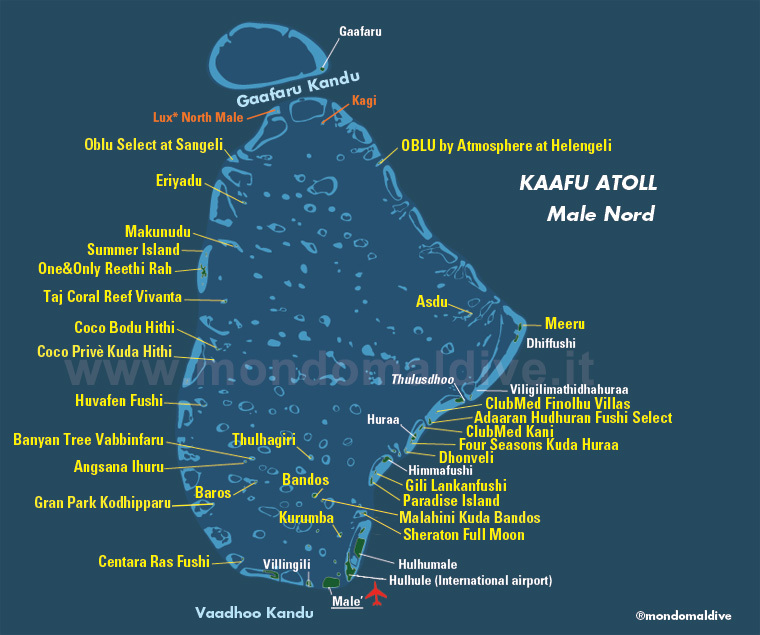 Hannes Reef is a small outcrop of rock lying near Maagiri reef at a depth of 20 meters. When visibility is good, it can be seen from the main reef across a sand saddle at 23 meters. The reef is no more than 30 meters in diameter and at the top is a large hole where diving dhonis sometimes tie their lines. Dense schools of blue-striped snapper congregate around this reef and on the deeper side at 32 meters are a couple of caves with big, shy grouper and as many as 12 lionfish. Invertebrates thrive here, including banded shrimp and small crabs co-existing with sea anemones. Pipefish are common and on the sand between the thila and the reef is a field of garden eels. 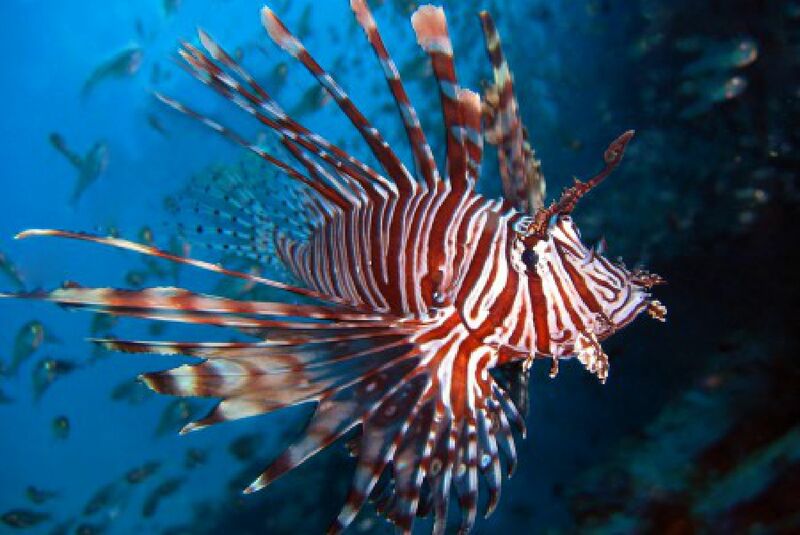 On the deeper side of the reef, caves are full of lionfish. This dive is spoilt if too many divers visit it at once and care should be taken not to damage the top of the coral reef with fins. Maagiri reef is a popular dive destination with several diving points. On the north side of Maagiri reef, a big rock at 20 meters appears to have broken away from the reef creating a semi-circular cliff with a canyon. There is also a big overhang there. Nearby are many small caves between five and 30 meters. 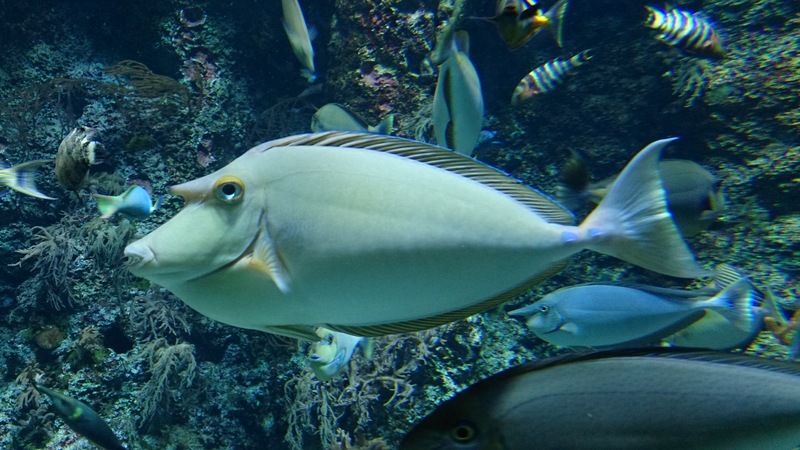 Snapper, big-nosed unicornfish, triggerfish, angelfish, fusilier, and eagle rays can be seen around the rock. On the reef top is a beautiful display of coral. This is a series of rocks rising from around 20 meters on the eastern side of Maagiri reef. Healthy stands of hard coral lie above 15 meters. It is a good site for beginner divers. Divers usually start their dive on the eastern side of the island where it is well protected during the south-west monsoon season. The reef top is gnarled and stunted down to the 10 meters because of wave action, but there is plenty of fish life. The reef drops steeply on the outside. There are several diving options. With an incoming current, divers usually drift into the atoll on the north side of the island where many triggerfish are to be found. With a gentle incoming current, divers can venture out to Furana Thila rising to eight meters on the north side of Furanafushi. 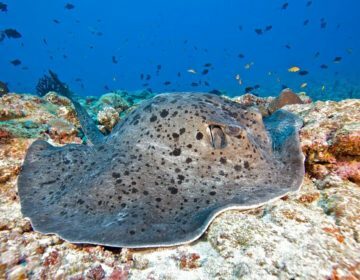 There are many surprises here including nurse sharks, eagle rays, mantas, and even whale sharks during the south-west monsoon. Divers can visit caves at 26 and 20 meters on the south and west sides of the Thila, then drift across to the south side of Kanduoiygiri. Near the main entrance to Furanafushi Lagoon is a small Thila with nice caves. Boat traffic can be heavy, so divers are advised to make sure they display a diver’s flag. With an incoming current, divers being on the eastern side of Furanafushi on a reef plateau at 10 meters that drops away steeply to more than 70 meters. The reef top has been battered away by wave action, and massive hard coral dominates the reef top, but it has created an ideal environment for small reef fish such as damselfish and butterflyfish. The best diving is above 20 meters and on the south corner are a couple of small caves at 10 and 15 meters. In the open ocean are sharks, eagle rays, dog-toothed tuna, snapper, and Napoleon. This can be a long drift dive and well inside Kuda Kahli channel at five meters is excellent table coral. When visibility is good, watch closely into the channel for big fish. Whale sharks are occasionally sighted along this reef during the south-west monsoon season and on the surface, large schools of dolphin are sometimes seen making their way through the atoll. 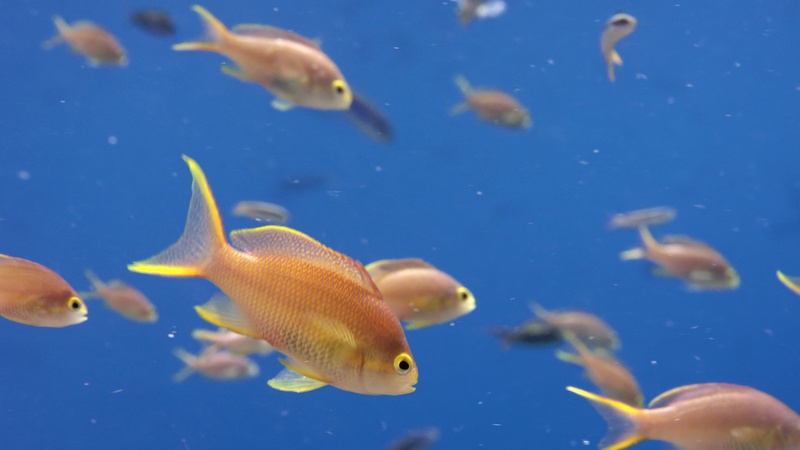 The reef top is an ideal environment for small reef fish such as damselfish (seen above) and butterflyfish. The island’s correct name is Kanduoiygiri. It has a good reef on the north, northeast and south sides and these can be dived separately. Farukolufushi outside reef is a long, easy drift dive popular with most resorts in the area because it offers good protection from strong winds during the south-west monsoon and it is not significantly affected by currents. Visibility is usually excellent, and many surprise encounters with big fish occur here. 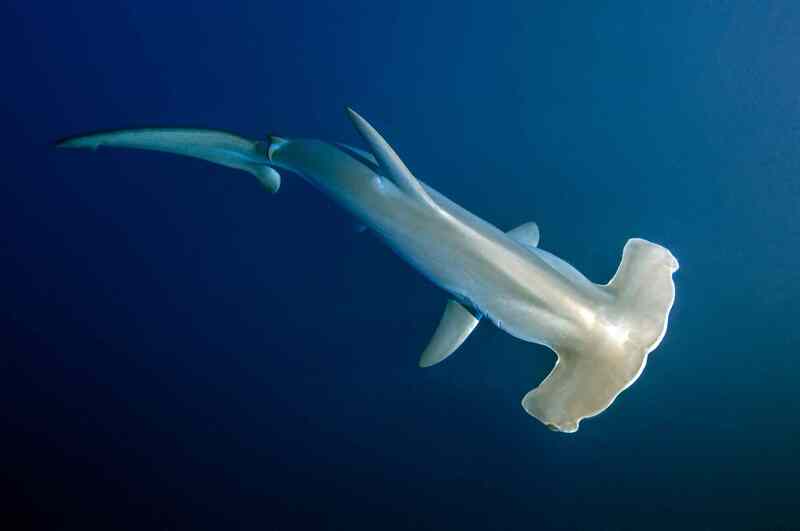 These include hammerhead sharks, eagle rays, great barracuda and turtles. Located on the same reef as Back Faru at the entrance to Kuda Kalihi channel is an interesting cave with big coral rocks at 24 meters. With an incoming current, divers will always see schools of surgeon, humpback snapper, large sweetlips, and soft coral. Just around the corner inside the channel at 10 meters are coral rocks sometimes with schools of powder-blue surgeon around them and many species of boxfish and pufferfish. Turtles favor this reef and have been seen sleeping in caves at night. Strong in-coming currents at the corner drag divers down and away from the reef. Banana Reef, named after its shape when viewed from the air, was one of the first dive sites to be discovered in the Maldives. It is the most northern of the two reefs west of Club Med. The best diving is at the northeastern end where there are big spectacular rocks, caves, deep gutters and steep overhangs. The scenery is amazing, and around these big rocks, predatory fish like shark, barracuda, trevally and black snapper converge. 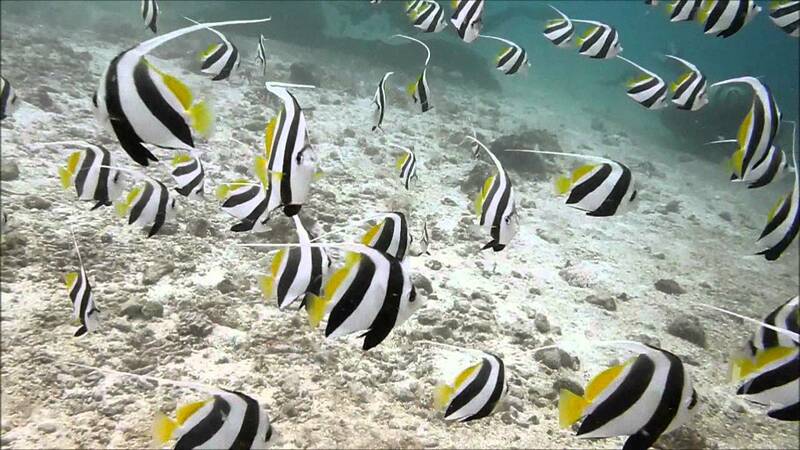 On the eastern fringe of the reef at 15 meters is a school of up to 1,000 schooling bannerfish. These distinctive fish have long dorsal fins and vertical black and white bands and always inhabit the same area. At times they are so thick that divers can barely see through them. Here also are large morays that entwine themselves in green coral trees. On the eastern fringe of the reef at 15 meters is a school of up to 1,000 schooling bannerfish. The caves have several species of grouper and some, like the snout-spot grouper, have become quite tame, mainly through fish-feeding. There are some pufferfish and many small species of wrasse. Cleaner wrasse are common, often swimming well out from the reef and into schools of blue-dash fusilier. Big schools of fusilier are everywhere, most noticeably the smaller striped fusilier and the moon fusilier. At the western end, a semi-circular wall drops steeply to 25 meters. There is a big cave here between 10 and 15 meters with a multitude of squirrelfish, including saber squirrelfish, immaculate soldierfish, and shadowfin soldierfish. Many swim upside down and all have big eyes to see in the dark. A little deeper is a small cave at 20 meters often with a moray eel and grouper inside. During strong currents, this concave wall is known as the ‘Washing Machine,’ generates swirling down currents. The Maldivian grubfish thrives on the rubbly bottom near the ‘washing machine’ at around 20 meters. Grey reef sharks can regularly be seen. On the reef, the top is some of the best table coral seen in North Malé Atoll and on cliffs and ledges between three and 10 meters are colorful sponges and coral. The Maldivian grubfish thrives on the rubbly bottom. During the north-east monsoon, spring tides combine with north-easterly winds creating powerful currents from the east. Be wary if diving at these times and if caught in the ‘washing machine,’ don’t fight it but stay close to the reef and ride it out. On the north side of Bandos is a short section of reef about 75 meters long with a big overhang dropping from five meters to 12 meters and at either end is a cave. Snout-spot grouper and morays are quite tame here. The overhangs are covered in the sponge and attract Moorish idol and butterfly fish. Close to the overhang at the eastern end is a big coral rock rising from 20 to 12 meters where tall-fin batfish, trevally, and snapper are seen. One of the great attractions of this reef are the black-tip reef sharks seen at 25 meters. 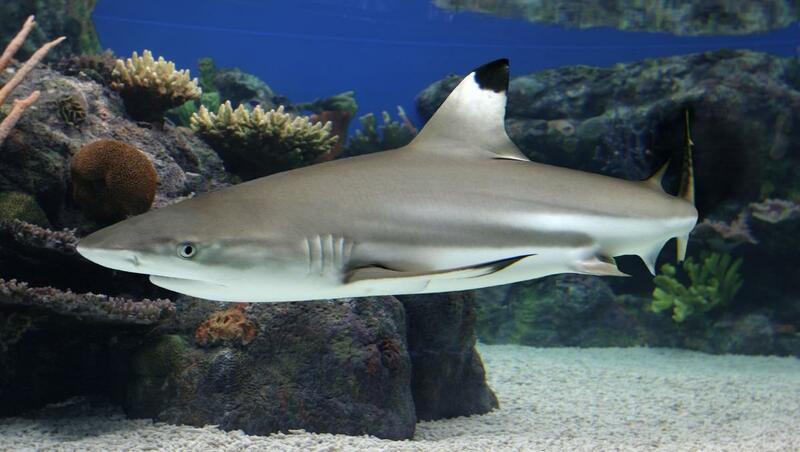 One of the great attractions of this reef are the black-tip reef sharks. On the east side of Feydhu Finolhu is a vertical wall 300 meters long with small caves, shallow overhangs, and some swim-throughs. The wall drops to 30 meters before leveling out to a sandy bottom, but the best diving is above 15 meters. 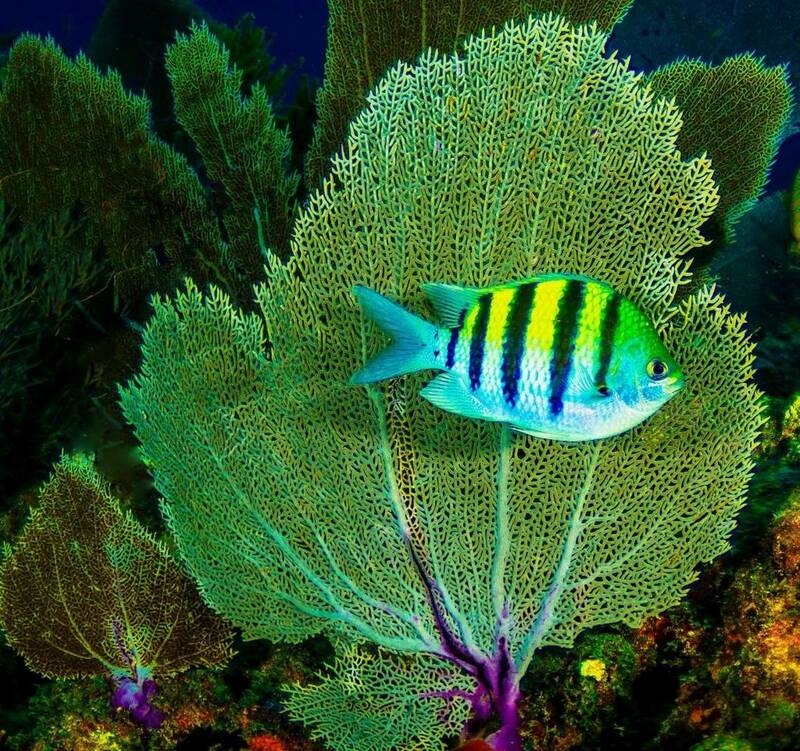 Black coral trees, some laden with mother-of-pearl oyster shells are common and give the reef its name. The branches of this coral appear greyish on the outside, but underneath the thin coating is the semi-precious black coral used in making jewelry and ornaments. On the bushes are black, yellow and green feather stars, some curled up, others with their arms outstretched to filter-feed on drifting zooplankton. Along the reef edge are colorful emperor angelfish, delicate flame basslet, the distinctive clown triggerfish and long-nosed butterflyfish. The wall is rich in invertebrates; tiny cleaner shrimp occupy little holes, cucumbers and starfish cling precariously to the wall and encrusting sponges of all colors; yellow, blue, green, and tubed white ones, compete for space. Along the reef edge are colorful emperor angelfish and delicate flame basslet (seen above). There is an interesting reef to the south-east of the island with caves and ledges, but diving is not encouraged here because boat traffic can be substantial. On the outside of Hulhule Island is a long reef, well protected from storms from the southwest. It is quiet and unspectacular, but visibility is usually good. When combined with the southern end of the reef, with its sharp corner and steep drop-offs, this dive – with the current going into Gaadhoo Koa – has a lot to offer. To the east of Feydhu Finolhu is Galhu Falhu Reef. This reef has been heavily mined for coral in the past and is now part of an on-going project to monitor coral growth in mined reef areas. Artificial reef structures were placed on the reef in 1990 in areas where coral mining 20 years ago have shown no signs of recovery. 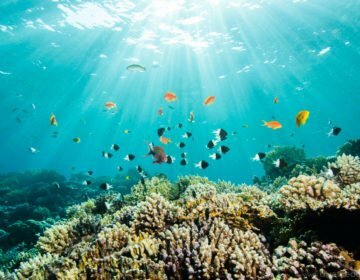 According to a report by Doctor Susan Clark, who initiated the project, coral recruitment to the artificial areas has been rapid, depending on the type of structure employed. Continued testing of artificial structures may lead to a viable method of encouraging widespread coral growth on denuded reefs. 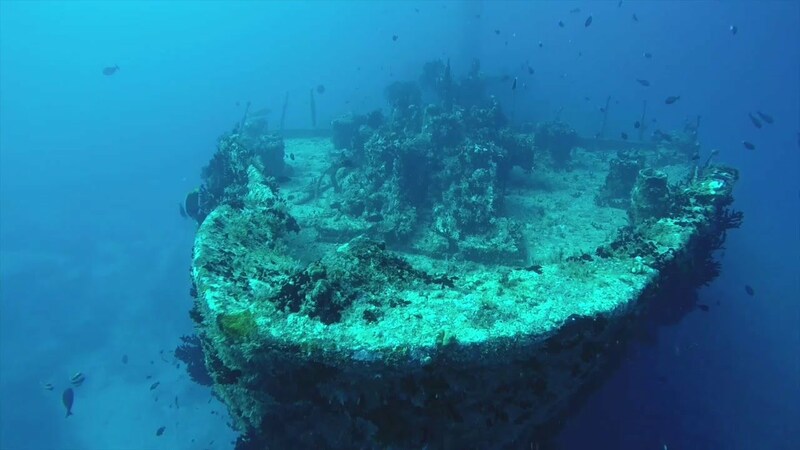 It started as a dramatic disaster in the early hours of Friday, February 13th, 1981, but the wreck of the Maldive Victory quickly became a focal point for divers and was soon hailed as a boon for the local diving industry. The 10-year old freighter was sailing to Malé from Singapore with a full cargo of supplies, mainly for the resort islands. The 83-meter, 3,500-tonne tanker struck the reef at almost full speed after the captain lost his way in the buoy-marked channel. Its hull was severely gashed, and it sank within minutes. All passengers and crew survived. On the day of the disaster. Diving instructors were quickly on the scene but were detained by the National Security Service before being released to officially dive on the wreck and report their findings. The 83-meter, 3,500-tonne tanker struck the reef at almost full speed after the captain lost his way in the buoy-marked channel. 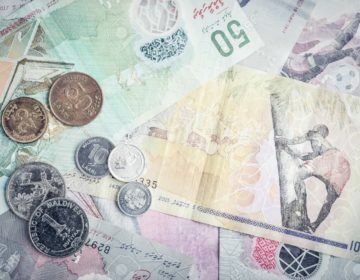 According to Maldivian divers, the salvage operation lasted nine months with teams of up to 20 divers a day retrieving to goods. Today, the wreck is stripped bare of anything of value, but there are, however, a few cassette players remaining on deck. They are passed from one diver to another and held playfully up to ears, as though they were still transmitting music played on that fearful night now known as Black Friday. 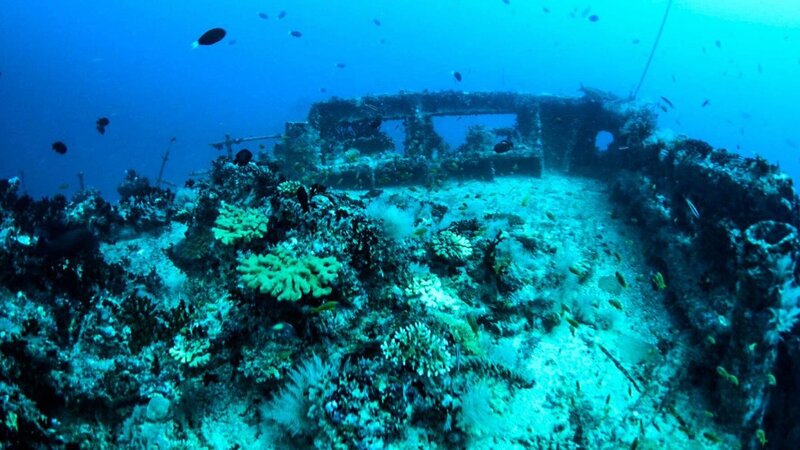 The wreck lies upright, tilted slightly to the port in 35 meters of water on the sandy bottom just off Hulhule reef. A buoy has been fixed to the mast at 12 meters, making descents easier in strong currents, which can be treacherous here, but once on deck, there is plenty of protection. The entire ship can be comfortably seen in one dive. A good plan is firstly to swim from the mast along the superstructure to the bow. On the way along the deck are three large holds that are wide open and easy to penetrate. Take a torch as it is pitch black down there. At the bow is an anchor that swings in the current and a large school of trevally gather here. From the bow return to the stern of the ship and finish at the bridge. A rope has been tied from the bridge at 16 meters to the mast to make ascents easier. Kikki Reef is a spectacular wall dive 100 meters long overlooking the depths of the Vaadhoo Kandu. It is set back into a large cavity in the reef and starts at either end with jagged overhangs cutting through the reef between five and 30 meters. A long swim-through in the wall at 28 meters is a good starting point if the current is flowing to the west. The best diving is between five and 15 meters where there are many caves and ledges. Small delicate purple sea fans cover the ceilings of the overhangs and in the caves are many species of grouper. The caves are also full of immaculate soldierfish and shadow-fin soldierfish. Commonly seen on this reef are the scribbled filefish, trumpetfish and the freckled hawkfish. If divers look carefully on the reef, they may see well-camouflaged leaf fish, and in the caves are white-banded possum wrasse and checked pipefish. This reef is covered in invertebrates and is a marvel for the variety of reef fish it houses. Commonly seen on this reef are the scribbled filefish, trumpetfish and the freckled hawkfish (seen above). Divers are advised at this site to take their time and look for the little things on offer. While carefully studying the fauna be particularly careful with buoyancy control as many of the overhangs are shallow. Stay out from the protrusions if not in full control. Old Shark Point is easily located on the outside corner of Thilafushi or ‘Thrash Island,’ the site of the Malé refuse dump. The western edge of the channel is a great dive because of the rocky outcrops peeling away into the deep blue waters of the Vaadhoo Kandy. There are pelagics like blue-fin jack, dog-toothed tuna, and mackerel scad. Grey reef sharks are regularly seen here in 30 meters of water. There is a long spiraling gully between a shallow cave starting at 10 meters and the rocks at 30 meters. Among the overhangs and gullies, are many fish and invertebrates. There are numerous anemonefish in the shallower depths with as many as 40 being counted in one sea anemone. Everywhere along reef are Napoleon, fusilier, surgeon, and some titan triggerfish, while in the caves to the west are stingrays. 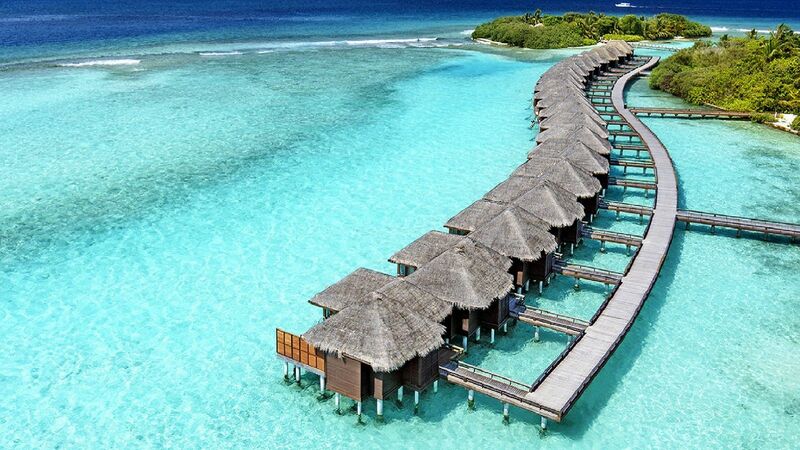 Experience these once-in-a-lifetime dives and book your hotel here. 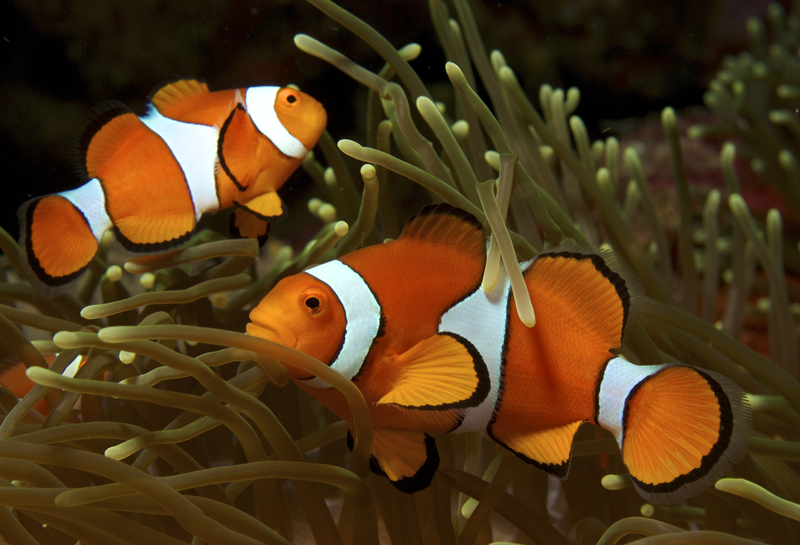 There are numerous anemonefish in the shallower depths with as many as 40 being counted in one sea anemone. Currents can be turbulent at this site. Currents can flow south through Medhu Faru Kandu into the Vaadhoo Kandu, where it often meets another current flowing east through the Vaadhoo Kandu. This intersection of currents, while usually resulting in a thrilling dive, also pushes divers away from the reef, sometimes up, other times down. Care should be taken during these times to stay close to the reef. This protrusion of rock juts ominously towards the 4.5 km wide Vaadhoo Kandu. The site is flushed with clear water from the 500-meter deep channel making it ideal for viewing the territorial grey reef sharks that patrol the area. A gently sloping ledge on the east side of the rock at 10 meters is a suitable place to sit and wait for the show to begin. When shark feeding was practiced in the Maldives, this was the theater. However, nowadays, shark feeding is not encouraged, and sharks can usually be found in their natural state without being harassed into a feeding frenzy. To the east of Lions Head is a long straight section of reef with caves and overhangs at five meters. 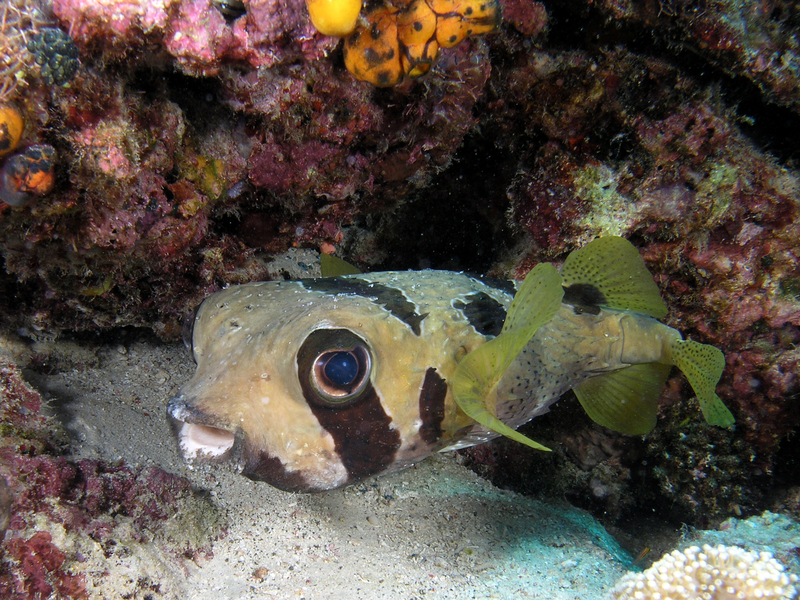 Many invertebrates, such as lobsters, octopus, sea anemones, sponges and pin-cushions are found on this section of reef and blotched porcupine fish are familiar inhabitants. More caves and overhangs are found at 20 and 25 meters, but the best diving is in the shallow water between five and 10 meters. There is no need to fear grey reef sharks in the Maldives. They are curious and often come within a few meters of divers. If, however, a shark puts on an aggressive display by lowering its head, pointing its pectoral fin downwards and swimming rapidly back and forth, then calmly back-up against the reef and retreat from the water. There are two peaks over a length of about 100 meters, and although the thila does not have as many spectacular rock features as many others, the fish life here is as prolific and diverse as any reef in the Maldives. The twin peaks rise from the atoll floor to 14 meters and six meters and among the delicate coral on the reef top are numerous species of damselfish. Circling above the reef are large schools of flame basslet and blue-striped snapper. 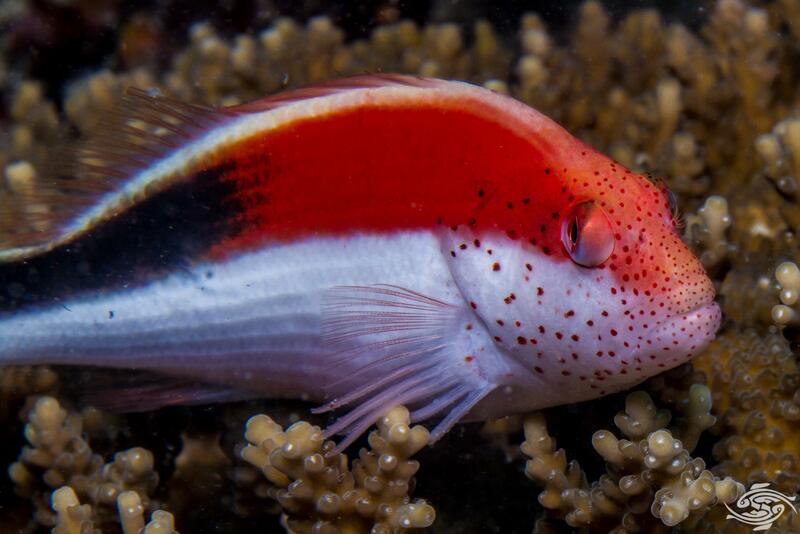 There are also many freckled hawkfish, long-nose filefish, and scorpionfish, including the common lionfish on the reef top. Feather stars have also found this a good site to spread their arms and catch the zooplankton that flows freely through the atoll. One of the features of the reef is a cave between 25 and 30 meters at the end of a ridge on the north side. Inside is a big bushy black coral tree with oyster shells. On the sandy, rubbly area east of the cave at 25 meters are many species of shrimp goby. 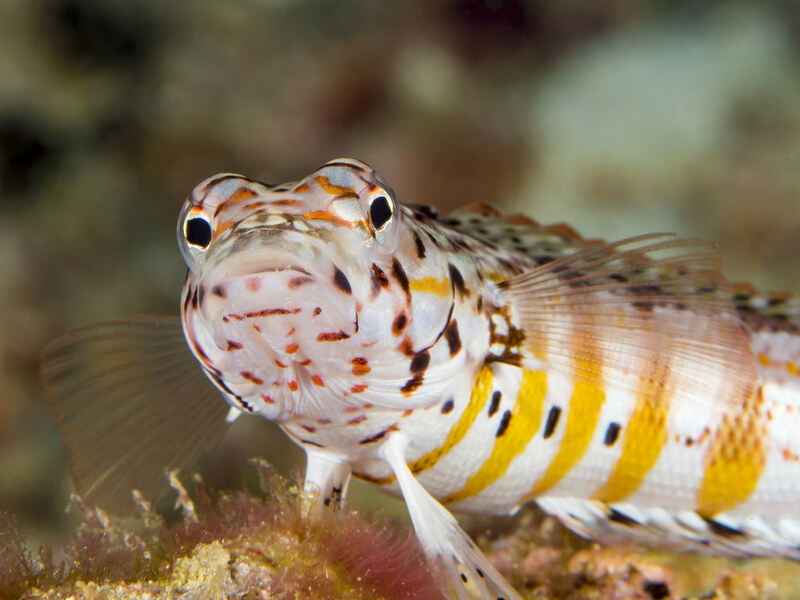 Careful and patient observation of these shy fish may reward divers with a glimpse of the near-blind commensal shrimp. 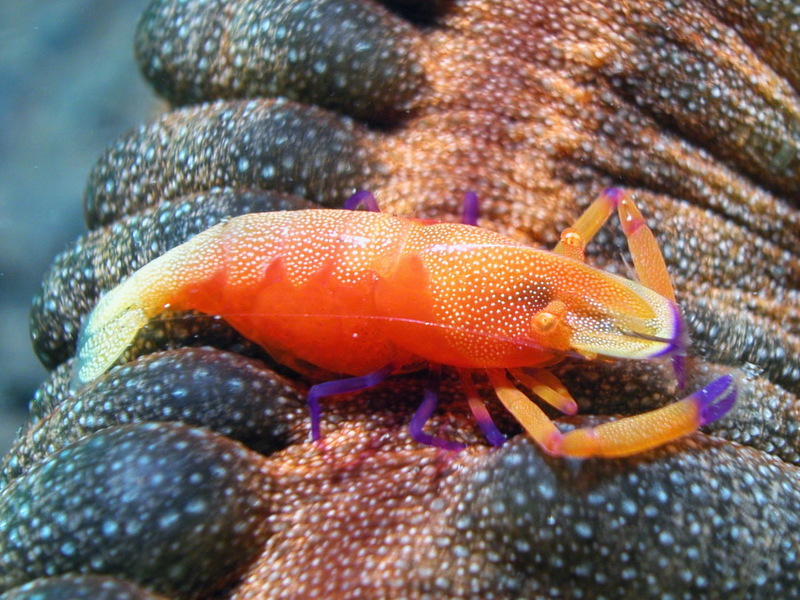 Divers may catch a glimpse of the near-blind commensal shrimp. There is a steep ledge at 35 meters at the end of a ridge on the western side. On the slopes of this ridge are big grouper including the giant grouper and the flower grouper. Also of interest on this ridge are two commonly seen species of emperor – the large-eye emperor, usually seen in pairs or small aggregations and the gold-spot emperor, often in schools and clearly distinguished by the glowing gold spot on its tail. There is not a lot of protection from strong currents at this site. Divers should take special care not to knock the brittle green coral on the reef slopes.